Darwin, the capital of Northern Territory, Australia, has a consistently warm climate and monsoon season similar to Singapore. 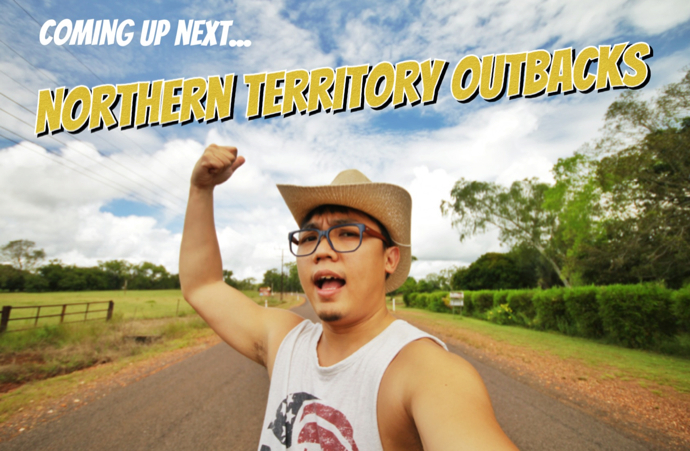 Darwin is also the hub where tourists stay over before heading out to renown outback destinations, Kakadu, Litchfield and Katherine in Northern Territory. 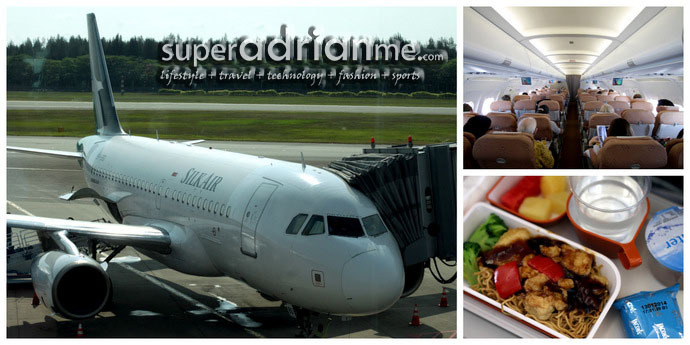 I flew on a 4 hour 40 minutes flight from Singapore to Darwin on SilkAir’s 1st year anniversary flight which was full due to its favourable flight schedule that departs at 10am and reaches Darwin at around 4pm in the afternoon. It was also my first trip down and we were going to visit Katherine National Park which houses the magnificent Katherine Gorge. It was also a great experience in the wilderness of the great Australian outback. But before heading to Katherine, we stopped over at Darwin City and manage to have a quick tour in the urbanised capital. 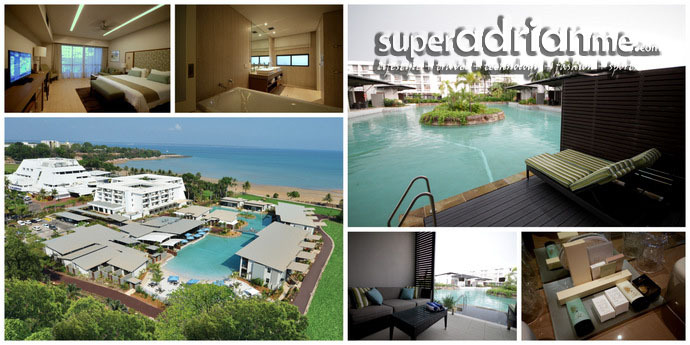 To get ourselves well rested before the outback journey, we stayed in the gorgeous Superior Lagoon Room that comes with a sun deck balcony which connects to the lagoon pool and a 30 metres man-made white sand beach at SKYCITY Darwin. The lagoon pool is heated, so we had a warm swim even with the chilling night breeze in Darwin. The Superior Lagoon Rooms come with a premium price at A$320 during low season and A$420 for peak season. Personally, I feel it is worth it and somewhat “affordable” for that special moment in life. And if the casino scene is your kind of thing, SKYCITY Darwin comes equipped with its own casino. Enjoy and spend your time within the hotel as you get some chips and head on to the slot machines or tables. 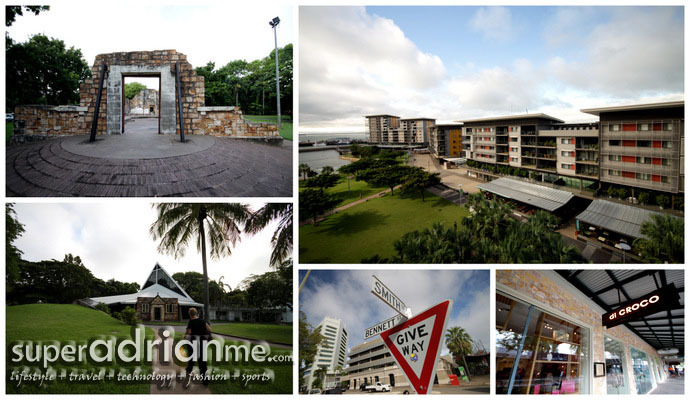 Only 20 minutes away from SKYCITY Darwin, stroll down the Darwin Waterfront in Darwin City. At Darwin Waterfront, it is more than just having a relaxing afternoon coffee in a cafe. There are a couple of lagoons for some recreational swimming and also the wave pool in Wave Lagoon where you can have a good time with waves up to 1.7 metres tall. Admission to the Wave Lagoon starts from A$5 for adults. On the way out of Darwin Waterfront, we walked passed historic monuments such as the porch of the Christ Church Cathedral and ruins of the Palmerston Town Hall – both are remains from Cyclone Tracy that hit Darwin on Christmas Eve of 1974. Only minutes away from the monuments, Smith Street Mall will be shopaholics’ haven for retail therapy. At Smith Street Mall, head on to the one & only di CROCO store in Australia for the best salt water crocodile skin fashion accessories and handbags made from a sustainable source. For budget shopping, there is also Factorie, an Australian fashion label offers affordable & trendy outfit and accessories for both boys & girls. Managed to grab three pairs of shoes from Factorie for a total for A$26.90. 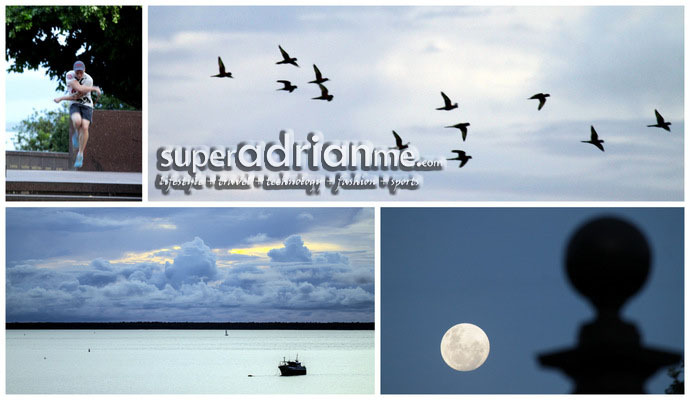 Just before sunset, walk a couple of blocks from the Smith Street Mall, and arrive at Bicentennial Park to catch a breather from the shopping and engulf in the wonders of nature where birds flying around along the coast and have a glimpse of the sunset before dinner. 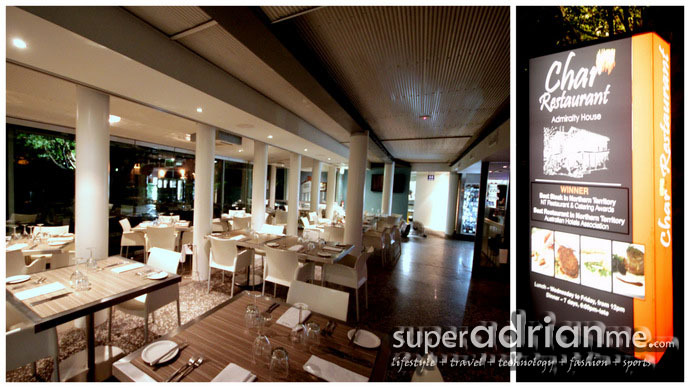 Here is a MUST GO dinner destination, Char Restaurant, one of the best steak housees in Darwin City which got awarded as Best Restaurant in Northern Territory by Australian Hotels Association. The interior decors are simple & chic with dim lighting creating a romantic ambiance. 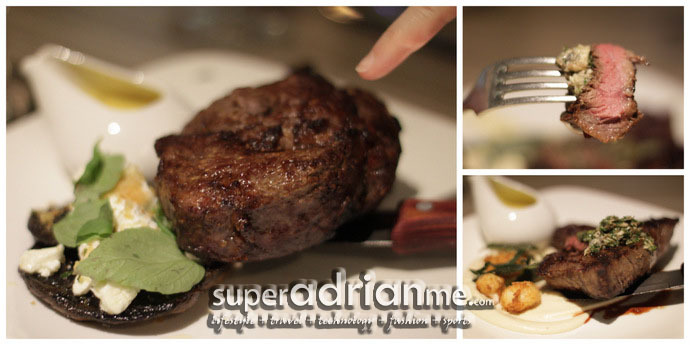 Be prepared to spend over A$50 per person, as the steak price starts from A$37 but it comes with two side dishes. The steaks are aged to perfection so they are tender and juicy with every bite. It is a great way to end the day after a day of sightseeing and shopping. 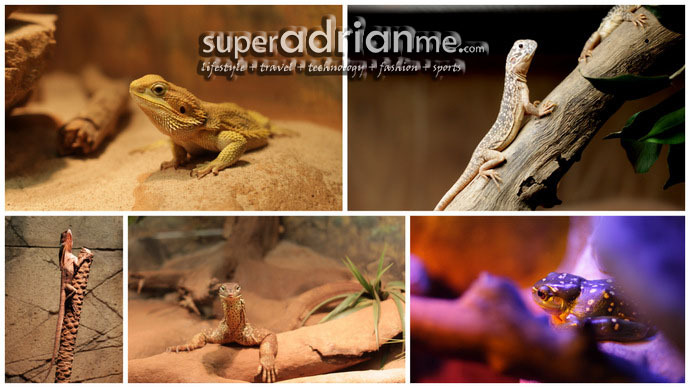 When visiting Darwin, we must meet up with some of our scaly friends to complete the trip. 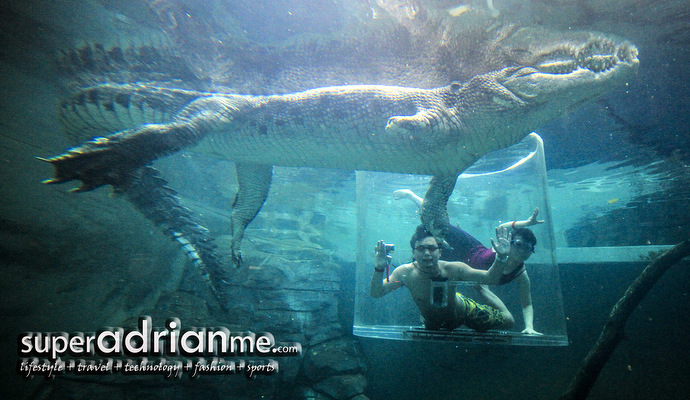 The best place to do so would have to be in Crocosaurus Cove in Darwin City. 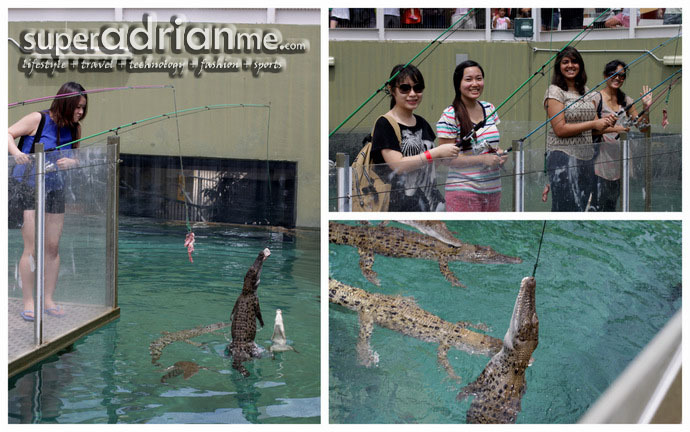 Unlike most crocodile & reptile farms that we have visited, Crocosaurus Cove provides different level of interactions with these caged animals, from viewing them afar from their cage or only separated by a piece of acrylic in Cage of Death. In the Critters & Crocs exhibition, view over 70 different species of the Northern Territory’s cutest and most deadly critters in their aquarium display, and learn how they survive in one of the harshest landscapes in the world. 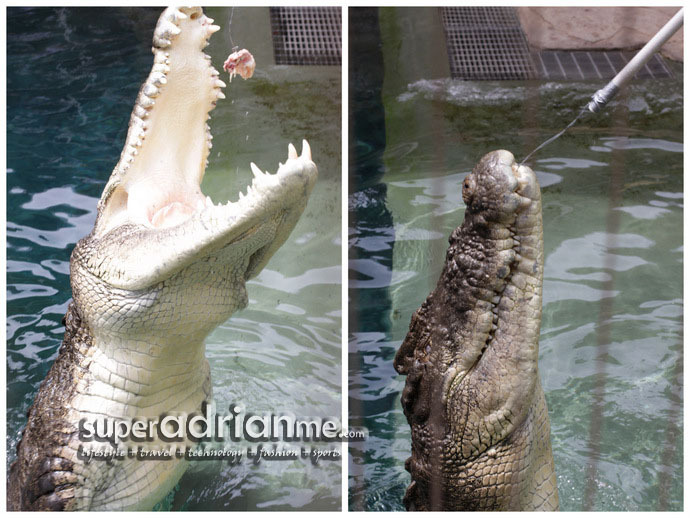 Have some live action, see the live feed of big salt water crocodiles by the Crocosaurus Cove keepers. If that is not enough, fish for juvenile salt water crocodiles with a rod and see them leap above the water to grab their bait. 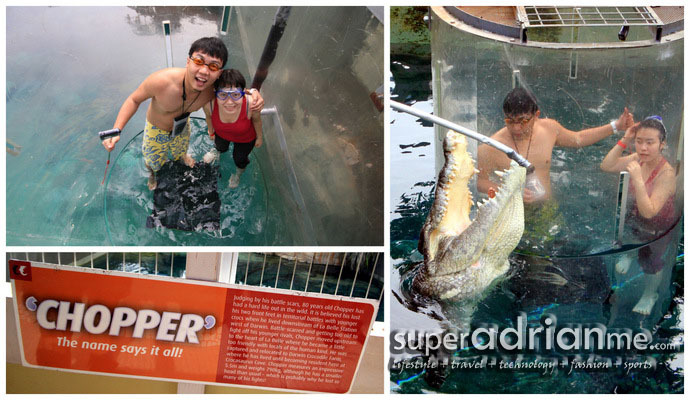 Too bad we were not allowed to fish the crocodiles out of the pool. After the sumptuous dinner at Char Restaurant from the evening before, we are ready to become “live bait” and to be holstered down to the pool where Chopper the six metre crocodile is resting. The only thing the separates Chopper from us is the acrylic cage and we can heard him breath through the gaps of the cage. If standing next to Chopper is not scary enough, the keeper starts to feed Chopper by the cage and you can feel the mighty impact of the jaws closing right before us. In this 15 minutes session, we had one important assignment … it is the “Crocosaurus Cove Next Top Model Challenge”. 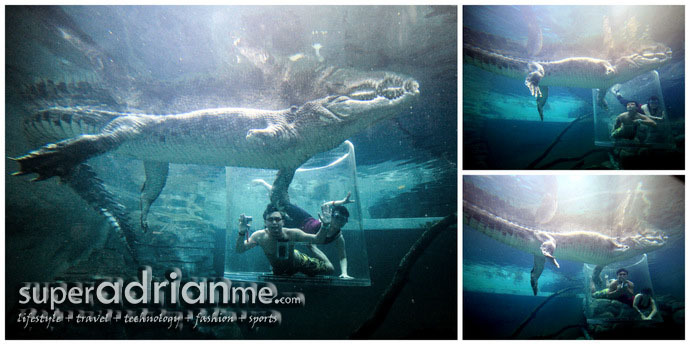 Swimming and staying underwater in the confined cage is already hard enough. Coordinating the timing and movement for both of us in the cage and watch out for Chopper’s position to get the best angle. Thinking back Tyra Banks famous quote “SMIZE to the camera”, now I understand that this is no easy feat. To experience the Cage of Death, one person has to pay A$150 and the couple package costs A$220. Both packages include full day entry to Crocosaurus Cove. If you do not have a photographer to help you take pictures, you will have to fork out an additional A$100 to get the Photo CD and one printed Photo from the photographer at Crocosaurus Cove. Well beggers cannot be choosers. There is a price for memories. Now we can go around and say we survived the Cage of Death in Darwin. If you really cannot afford that, go for the A$30 normal entry ticket to see other dare devils in action. With many attractions within walking distance, Darwin City is a great rest & relax stop over destination before heading out to the outbacks of Northern Territory, Australia.